A plea to focus a little bit more on the subject at hand—food! It’s still the holiday season, and though end-of-year traditions are mostly behind us, that doesn’t mean it’s time to take off those oven mitts just yet. There’s plenty of cold weather, potlucks, and New Year’s parties left to keep those of us who feel at home in the kitchen busy. After all, whether it’s the frigid temperatures or the political situation in this country—consistently somewhere along a spectrum between “Oh, no! !” and “WTF!! 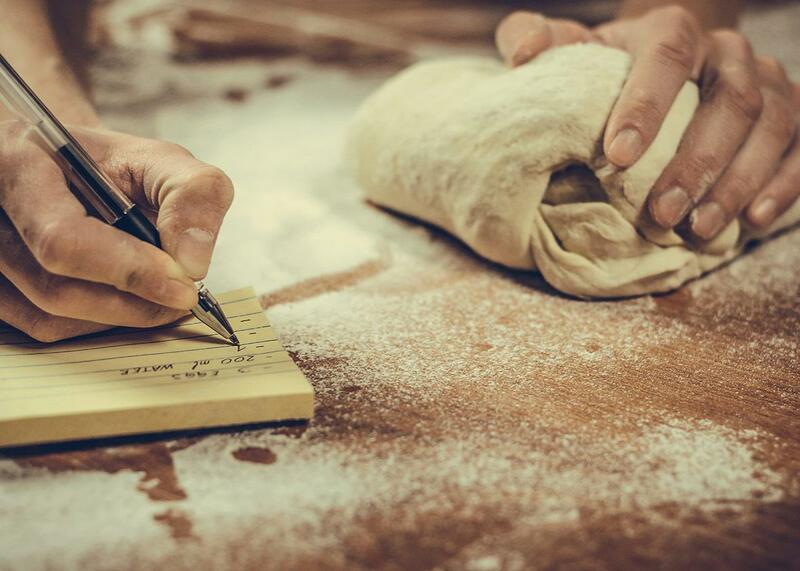 !”—a little cooking or baking side hustle can be near therapeutic. Whatever the cause encouraging you to try your hand at baking your favorite kind of bread or stuffing grape leaves or frying chicken, any resourceful wannabe chef knows that the best place to find a recipe these days is the internet. But let’s say you want to cook something special. From the heart. Not a dish that thousands of people have tried and reviewed on AllRecipes.com. So you go on the hunt for a charming little cooking blog, where a dedicated food journeywoman (or man) has a recipe so good and so authentic that it was worth sitting down to type it up and share with the world. I love a good food blog. The mixed fonts and cellphone photos give the kind of colloquial comfort and charm I crave online. These labors of love are a needed respite from platforms like Facebook, with their clean user interfaces and obnoxious sorting, that have largely replaced the personal websites that used to comprise sprawling online communities. Still, as with any medium that gains a modicum of success, even the world of homespun online cooking blogs has started to feel a bit formulaic. My chief complaint: the annoying and increasingly ubiquitous tendency to start with a personal story, that if allowed to continue, could easily be expanded into the preface to a personal memoir. Take this recipe for challah from one of my favorite somewhat-off-the-beaten-path recipe sites Smitten Kitchen. Before venturing into detail about making the bread itself, and long before the list of ingredients, the author opens with a meditation on her favorite Yiddish phrase. “A shonda for the goyim means, roughly, that someone of the Jewish faith is not only doing something shameful (shonda), but doing it in front of non-Jews, which of course is an entirely worse offense,” writes Deb Perelman, the writer behind Smitten Kitchen. (Now, in my Jewish family, I was told that the word “goyim” was derogatory and mean-spirited, but that’s beside the point.) Perelman continues to say she has a great story she’s holding back about eating ham and cheese on matzos (that her mother may have to pay her not to share) and how it’s a “shonda” that she didn’t have a good challah recipe on her blog earlier. I’ve now had a couple of non-Jewish friends share this particular recipe with me, making jokes about how they’ve had success even though they’re “goyim.” My eyes rolled, but I’ve never had the energy to offer an alternative interpretation to the word—at least not over email. (I’m Jewish, yes, but barely practicing, and definitely no authority on Yiddish.) I just wish that Perelman hadn’t started her recipe with this largely irrelevant anecdote. This isn’t to say it’s never cool to add a short story on top of the recipe; it can be great to do so. The short blurbs in The Joy of Cooking giving a little history of some recipes almost always make me smile. Those typically give context to the origin of the dish or offer some bizarre yet researched tale about how an ancient monarch once unreasonably demanded it during a long journey or how the dish is considered a sign of friendship somewhere thousands of miles away. But unlike the food blogs of today, the snippets in The Joy of Cooking tend to only offer a moment of story time if it helps the reader and would-be cook understand the utility of the dish, its unexpected history, or a trick for making it just right. They’re also usually no more than a couple sentences. But, as with the Smitten Kitchen recipe for challah, most of the food blogs I come across today give far less useful or entertaining anecdotes. In this example, knowing that the author has little knowledge of Yiddish doesn’t provide anything interesting about challah itself, the history of eating the bread during Sabbath, or what the different braids can symbolize. I was folding towels on the counter when I looked in the mirror and noticed, over my shoulder, the small white stool pushed in the corner of the bathroom. It has been, for I don’t know how long, maybe as long as we’ve been in this house, the stool the boys use when they’re brushing their teeth, or washing their hands, or filling up a cup of water to drink. That stool makes a creaking scrape of a sound as it’s pulled across the floor, which is amplified by the shower tile, so, in the middle of the night, you’re always notified when someone short is thirsty. What does this have to do with varied uses celery root or the history of rösti? The author connects her story about laundry to a realization that her boys are growing up to an impulsive need to make a hearty breakfast. (At least it eventually relates to the food?) This is relevant information for her friends and family. But most people on the hunt for dining inspiration probably don’t care. One of my favorite recipes, a cauliflower tabouli, blogged about on Not Without Salt, opens with a multiparagraph manifesto about how the author’s family has decided to start rating their dinners with a scale of one to five stars, depending on how many people clean their plate. Which, again, fine, but I’d much rather read about tabouli, one of my all-time favorite salads about which I unfortunately know very little. It’s not like all short stories about how the chef stumbled on a recipe are unwanted. Sometimes they can help add context and even authenticity to the instructions posted below. One food blog I’ve found, Stefan’s Gourmet Blog, is more tolerable. His recipe for stuffed grape leaves, a dish I love to cook and am always looking for variations on, opens with a one-paragraph story about how he ran into an old Turkish classmate from high school who was raving about her mother’s stuffed grape leaves dish before jumping into a warning about how the rolling can be tricky. That is personal, useful, pithy, and endearing. But there’s really no need to open every online recipe with the initial drafts of a personal essay. In fact, the more people do this, the more formulaic it feels, eventually becoming perfunctory rather than inspired, which kind of belies any attempt at being more personal in the first place. So food bloggers, if you’re reading this, consider opening with a short history lesson, or an item on the name or the science behind the dish, or even a reflection on how the dish appeared in a popular book or film. Food is the centerpiece of so many interesting stories worth telling. The recipe-specific tales are much more memorable than your five-paragraph personal essay about how you worked in finance before you found you passion for blogging about casserole, anyway.